I once heard an interior designer say that when buying furniture for your home, that you should measure the space you are buying the furniture for, and discount 18 inches per measurement to prevent the appearance of overcrowding and allow for better flow when the furniture is installed. The same thinking could also be used when planning your Toronto office space. You do not want to put people into an office where they feel that they are on top of each other. In a small office, you do not want a tight fit. You want to maximize the space, but you also want to give each person enough space to work comfortably. By discounting the 18 inches in your planning and best utilizing your office space Toronto, you will have an easier time fitting other additional items in the office space – items that you had not planned on including. This could also be helpful if you need to reconfigure the office to fit other work stations, filing and storage, or even specialized office equipment. You can also take the guesswork out of designing and planning your office, by instead looking at a serviced office location – that is, an office that comes with furniture that can be configured to your wants and needs based on the office space Toronto you choose. 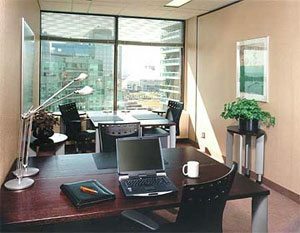 When designing the office space Toronto layouts at Telsec, our experienced office staging team has the exact measurements of the various offices as well as the many different types, styles and sizes of office furniture that are available to our office space Toronto clients. Our design office support team takes the guesswork and measurements out of the equation, because they know what furniture will work best in each of the many offices available. Our staging team knows that people who are looking to rent Toronto downtown executive suites for a single person, will probably want a single executive style desk, a lateral filing cabinet (that’s more aesthetically pleasing) and sometimes a table with a few chairs for small meetings. Small companies who want to share a large single Toronto private office for 1-3 people will more likely want smaller workstations and vertical file cabinets (that take up less floorspace), shelving and a very small table. Then there are larger businesses that need one space for a team of 7-30 people. These companies will look at various sized Toronto team office space configurations and a variety of furniture choices.